The Midwest Augustinians are pleased to announce our new perpetual enrollment card is now available. All contributions made for perpetual enrollments in the name of a loved one will include them for all time in countless Masses, prayers and good works of the Augustinian priests, brothers, and men in formation. Each perpetual enrollment card (5 ¼” x 7 7/8”) comes printed on firm, yet lightweight, textured cardstock. The cover has a gold foil seal of the Augustinian Order and the interior has a beautiful painting of Our Mother of Good Counsel, the patroness of our Midwest Province. Each card is mailed with its own envelope for your personal use. We ask for a suggested contribution of $30.00 for each perpetual enrollment. To request your perpetual enrollment card, you can visit our Prayer Enrollment Cards web page by clicking here. 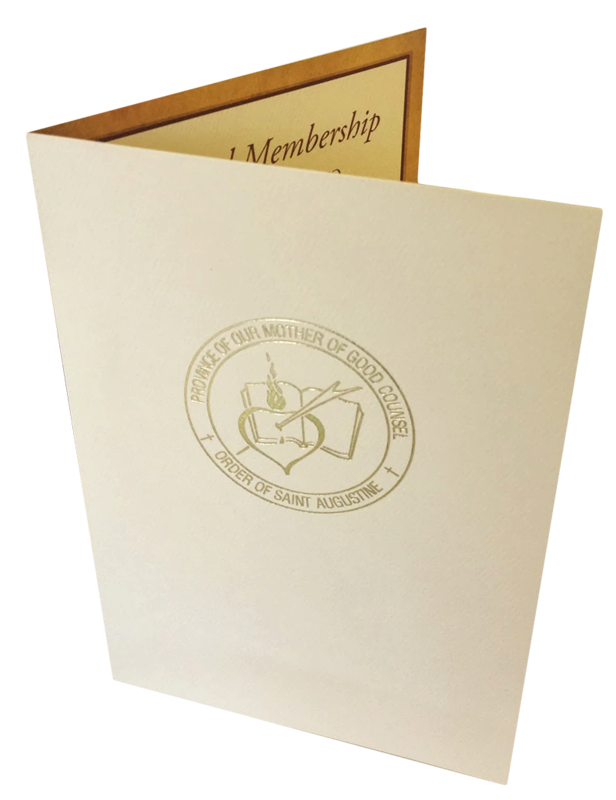 You may also request a card by emailing advancement@midwestaugustinians.org or calling 773-595-4008. All voluntary contributions for Prayer Intention Cards and Novena Enrollments support the Augustinian men in formation and vocations outreach program, retired and infirm Augustinians, and Augustinians missions in Peru.